Cairns....A Cairn is an ancient custom of stacking stones to mark trails. They are still used in many parts of the world. They can be as simple as a pile of stacked rocks or delicately balanced sculptures. Cairns are also used to mark memorials and for ceremonial or meditative purposes. 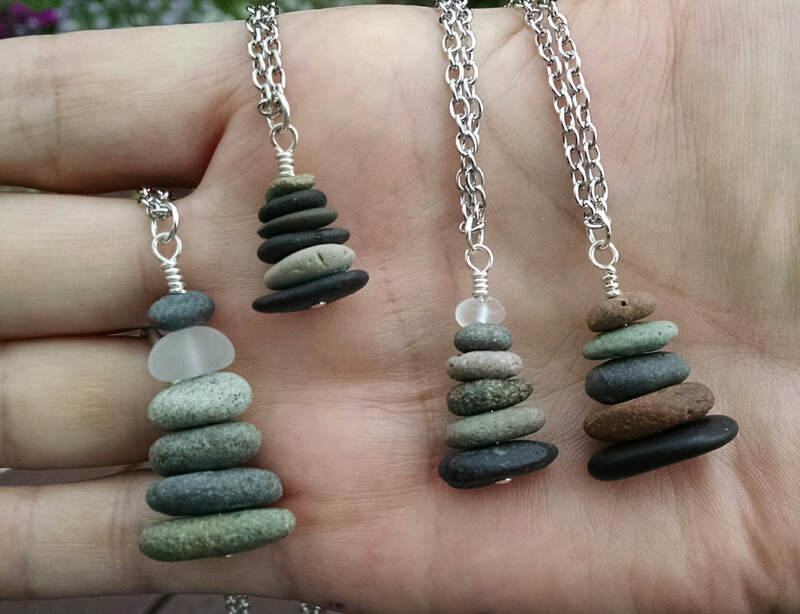 Each tiny Cairn pendant is unique...tiny flat rocks, little chubbie rocks, white rocks, black rocks, grey rocks, red rocks even speckled rocks . Some with beach glass, the possibilities are endless...Nature is the greatest inspiration! but check my Etsy site to see my newest designs. My "Globe" style setting of a single beach rock. has been sold. I have made smaller and larger.